Summer has arrived in the Etui-Camp in Dresden. But instead of lying lazy at the lake, we are charming new sounds out of the machines and are sitting with warm soundcocktails in the studio. Thereby the 3rd Etui Summer Camp has been created. This time, in addition to some exclusive tracks, we also included some music by artists of befriended labels from Germany, Italy and Greece and have compiled a package of essential summer tracks. They range from smooth dubtechno to deep and groovy techhouse to detroit-techno and therefore is once more an outline of the musical work of artists within the Dresden Etui-circle. Melted recording’s Echtzeit is opening this year’s compilation with his dubtechno track „CL2“ and also our new label artist Monomood is wandering through the early morning fog of dubtechno. Adverb with his “Manipulate” and Alec Troniq with his remix for Martin Hayes “Blossoms & Colors” take us into the shadow with dark tech-house. In his remix for Autodeep’s „Rose on the concrete“, Greek’s Bpitch Control artist Mr. Statik masterfully combines the beats with catchy chords and pads. Insect O. turns up the luscious synth-chord in his „Bankok“ to dreamy techno and Diego S is sailing with his „Anava“ using various catchy vocals and samples towards the sun. Also Helly Larson is using some sunny synth-sounds in his “Vision”. With „Big City“ Zero in Something are giving a harmonic afternoon chiller with ear worm potential while sparing straight beats- yes, that’s the real pleasure. But also our sportive dancegroup is not missing techno. Harada, who is represented with a track on the current „Body Language Vol. 10“ from M.A.N.D.Y., and Knobs from Rom are spreading the good mood in the camp with their techno sounds. Kryptic Universe tops with his detroit-techno piece „Chandler Park“ this year’s summer package and Echtzeit clompletes with his wonderful dubtechno track „Parafin“ from 1999. Buy Etui Summer Camp 3 on Whatpeopleplay. 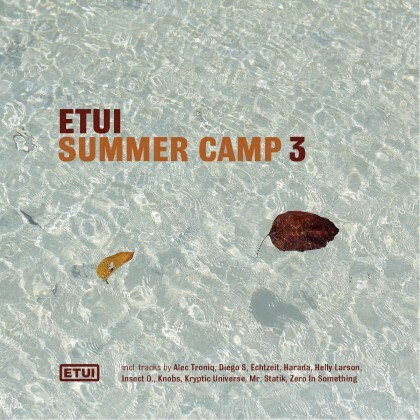 Buy Etui Summer Camp 3 on Beatport. Tracks 1, 13, 14 are licenced from Melted Recordings. Tracks 4, 7, 10 are licenced from Etoka:Shapes. Copyright and production by Etui Records 2011. All rights reserved.